Its the Art, All the Art, Stupid! Which has more power, words or pictures? In our media-saturated culture today, it would seem that pictures always carry more power. I notice that Facebook posts with pictures usually draw the most interest. And “as little as possible” is the amount of text that works best with the picture. At the same time, there are some things a picture cannot tell us. There are subtleties of meaning and even information that are best served by text. And, for me at least, there is always the beauty of language well used. 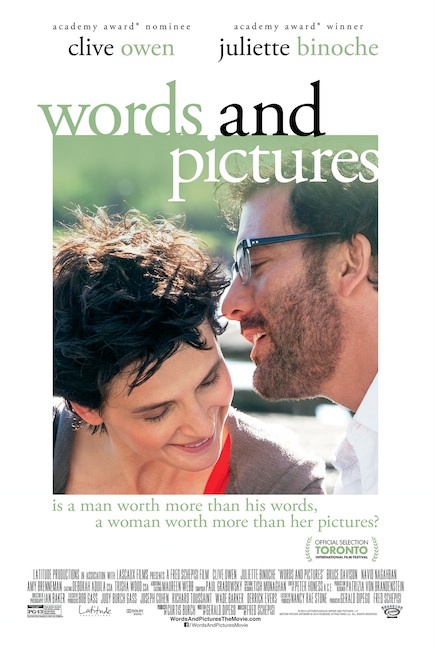 A mew film, “Words and Pictures,: explores all this in a most delicious way. I urge everyone I care about to see it. Indeed, I urge everyone who cares about the liberal arts in our culture to see it. Jonathan told me we were goint to see a romantic comedy with Clive Owen and Juliette Binoche. That sounded good by itself–two accomplished actors can often be good. But this is no simple romantic romp. I don’t want to give much away, because not knowing anything in advance surely helped me enjoy the film. Suffice it to say that Owen plays a troubled “Honors English” teacher at a prep school (in what appears to be Maine) and Binoche plays a painter who is hired to teach “Honors Art” at the same school. Sparks fly between them pretty much from the beginning and more sparks fly around campus as they rouse their students in a “war” over the question I raised at the beginning of this post: which has more power, words or pictures (of course, some students are taught by both)? Owen delights in playing word games with colleagues and in quoting authors to his student to show how vital good words are. 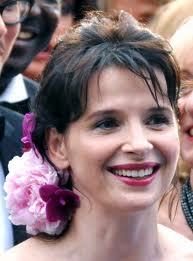 Binoche demands much of her art students and seeks always to beat Owen at his own word game (she’s pretty good). So it is fun, even as at moments it turns sad and depressing. But the real deal for me is the evocation of art–spoken, written, visual–as something really vital, indeed absolutely necessary for life. 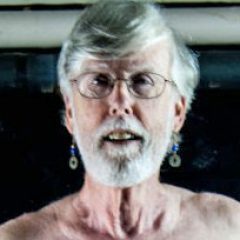 In less than two hours, I was reminded in the most beautiful way of why the liberal arts matter, why choosing the right word is of first importance, why painting the truth is absolutely essential. And if you don’t believe me, stick around till almost the end of the credits . . . . . to see the identity of the painter of Binoche’s paintings.